Creating content is only half of the learning development story. The other half is developing a plan for evaluating the learning. This requires crafting tools used to gather feedback that informs whether learners actually learned, as well as to determine to what extent learners apply what they learned in the workplace. 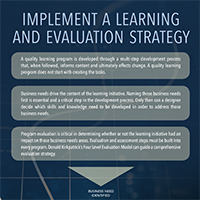 This infographic describes how you can use Donald Kirkpatrick's Four Level Evaluation Model to guide a comprehensive evaluation strategy.